Instagram hit the App Store October 2010 as a free, photo-sharing social network for iPhones, iPads, and iPod Touches. Although it’s expanded to Androids, and its pictures can be shared on the Web, it’s still strictly a mobile app. Instagram became big with the under-25 crowd, whose members loved to post vintage-y looking snapshots with a little help from the app’s sixteen filters for digital photos. Like on Twitter, posters could follow and be followed, and like on Facebook, users could comment on pictures. Facebook saw a dangerous rival, and before Instagramers finished complaining about the April influx of Android users, the news spread that Facebook had just bought the 13-employee company for $1 billion. Suddenly, Instagram was losing some of its cool, though going mainstream always means more money. 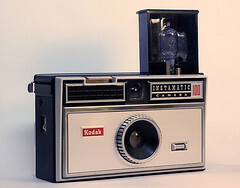 Above, the Kodak Instamatic is pictured — it’s the old-school cam, along with the Polaroid, that inspires the look of Instagram’s filters.